The main criticisms I raised in my review of the first act of Broken Age were the ease of the puzzles and the short length. By definition, the length issue would be resolved when the rest of the game was released. As for the difficulty curve, I surmised that the second half would kick it up a notch in true genre fashion. While the second half (or more accurately later two-thirds) of Broken Age mostly makes good on the puzzles, a slightly rushed and muddled plot doesn't pay off on the potential sewn in the first act. By and large, my impressions laid out in my initial review stand true. The graphical style, voice acting, and quirky dialogue all pique my inner-child. The experience is less about hilarious situations and more about evoking a sense of wonderment. Revisiting previously seen areas with a new perspective keeps this feeling going strong all the way to the end. The varied locales contrast well with each other and the characters found therein mesh well. Each component part of Broken Age is well-crafted but, unfortunately, the grand synergy of them doesn't add-up. Without spoiling anything, I felt that most of the characters were static and several opportunities to have them interact with each other missed. The idea of characters who function as talking objects is the product of archaic genre design that I really hoped would be improved with a modern approach. Each character exudes their own charm. It's difficult to criticize the plot of an adventure game without ruining one of the key draws of the genre so I'll try to keep it general. 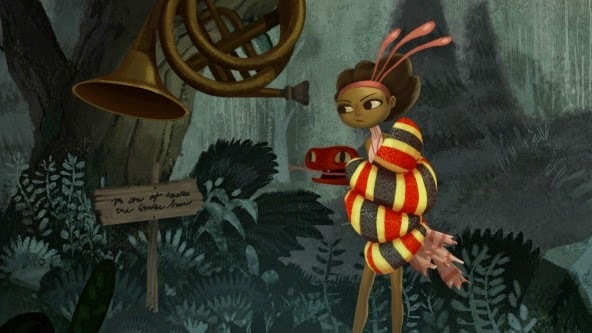 The story arc of Broken Age sets up well and the end of the first act promises a strong reimagining of core premises. Unfortunately, the stranger in a strange land potential narrative of the second half doesn't materialize and I felt that interactions that should have been wrought with tension or surprise at the given circumstances weren't there. Making matters worse, the chief antagonist is revealed late and their motivations are accounted through two conversations that demand more questions than provide answers. The vague plot leaves a lot open to interpretation (which isn't necessarily a negative) but can be jarring when the final credits start to roll just as the player is expecting an epiphany. Ultimately, the plot doesn't break the overall experience and doesn't make any of the characters less memorable, but it does feel like something a bit tighter would have tapped the deeper potential that is gently boiling below. The puzzling of Broken Age is first class with two notable exceptions. One puzzle involving a snake desperately needs a clue buried somewhere. I found no definitive hint at what to do and ultimately needed to resort to a walkthrough to progress. I can handle puzzles where I fail to make the jump in logic but, after consulting the walkthrough, I don't believe I would have ever come to the solution as it is unique to the gameworld. Maybe fans of Monkey Island who have tested Guybrush's claims of swimming prowess will feel less cheated by this puzzle. The second puzzle I take issue with isn't so much for the difficulty but the sheer tedium. At several points you are asked to progress by setting wire on a circuit board, often I had the solution of what to do in mind but would end up spending several minutes writing down notes and trial-and-erroring my way to enacting it. The puzzle is designed so that you can't brute force it easily and really need to know the solution but the fact that you have to go through it multiple times just makes it a pain. The aforementioned oddities aside, I felt that the difficulty was just right. The final sequence demands a level of interaction between the protagonists that effectively culminates the design logic set by the rest of the game. Genre newbies will probably be confused by some of the puzzles but, as a veteran, I found it a healthy dose of classic adventure game sensibilities. As a long time fan of the genre, I really want to love Broken Age. I feel an amazing graphic adventure might spur more development and I pine for the Lucasart heyday of the early 1990s. Unfortunately, Broken Age is merely good - not great. 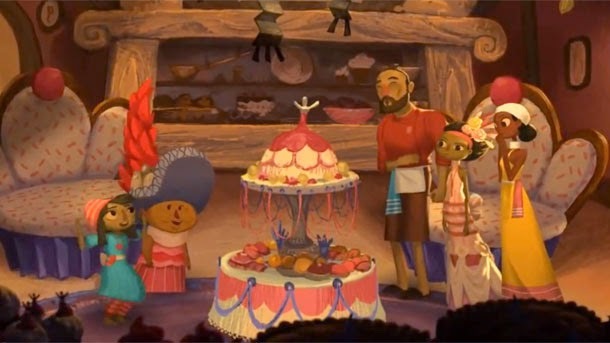 Though it reminds me of why I adore the genre and specifically Tim Schafer's work within it, Broken Age is unlikely to lead the charge of a new wave of graphic adventures. If you wax nostalgia for games like Day of the Tentacle and Full Throttle, then you probably already own Broken Age. If you've never played these before, I would still recommend giving Broken Age a whirl though I won't purport it to be the best of the genre.